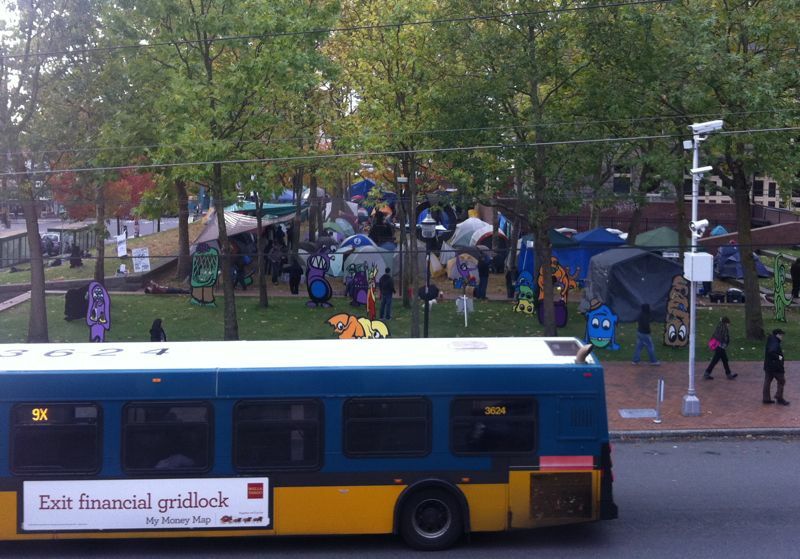 I’ve been doing some contract work lately for a product design consulting company in Seattle, and their offices are directly across from the Occupy Seattle encampment on Capitol Hill. Every day, I grow more and more convinced that setting up some tents on the lawn of a community college is a pretty ineffective way to get any real message out. In the 2010 state election, voters in Washington nixed an initiative to tax those earning more than $200K per year, only an estimated 0.5% of the population but with a projected $2.9 billion annual revenue. This is exactly the kind of revenue Washington desperately needed to fund schools, health care and other programs that serve basic public needs, programs that are now on the chopping block. But Steve Ballmer, Paul Allen, Jeff Bezos and a horde of other people and corporations poured millions of dollars into advertising against that initiative so they wouldn’t have to pay these taxes themselves, and it worked. From their point of view, those millions were a drop in the bucket compared to what they would have lost paying the taxes, so it was a no-brainer. Can you blame them? Instead of pointing fingers at these people and corporations — such as CostCo, who recently spent $18+M to successfully push through an initiative in favor of privatizing liquor sales in Washington — I fault the system. What should by design be a self-correcting government is instead a system where it’s possible for those with large amounts of money to effectively change regulations to ensure they keep making money, stay rich, and stay in control. A couple weeks back, a coworker sent me this video, which is intended to be funny (I think) and supposedly demonstrates the hypocrisy in a day in the life of an Occupy protester. But it made me so mad because they got it all wrong — the Occupy movement isn’t anti-Capitalism, it’s a protest against a system where people and corporations who are already extremely rich are guaranteed to continue making absurd amounts of money, at the expense of everyone else. Financial transgressions going unpunished (and sometimes effectively rewarded), oil companies being coddled and subsidized, and the successful lobbying in Congress that pizza should remain a vegetable are all further examples of how this system is a feedback loop out of control. So what happens next, then? Sadly, I think the answer is that it gets worse before it gets better. The kind of changes that ought to be made don’t come easily or quickly, and it’s not pretty in the meantime. Hunker down, friends, it’s gonna be a tough few years at least.